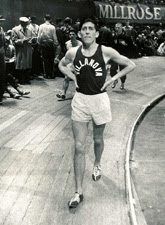 June 14, 1956: Villanova’s Ron Delany, the 1956 Olympic 1500-meter champion, closed out his brilliant collegiate career by winning the mile and 880y at the NCAA Championships in Berkeley, California. Up first was the mile, with Cal’s Don Bowden, the American Record holder, setting a fast pace in an attempt to blunt Delany’s feared kick. Delany, mindful that he still had the 1/2-mile coming up, was content to stay near the rear of the chase pack. Bowden couldn’t maintain his quick tempo, allowing Delany to gradually move up and the Irishman went on to win his 3rd NCAA outdoor title in a row (1500 in 1956). 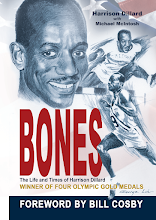 Bowden faded to 4th, while Oregon’s Jim Grelle, a future American Record holder and the 1959 NCAA champion, finished 2nd to Delany for the 2nd year in a row. Delany was at his exciting best in the 880y, coming from more than a second back with a 1/2-lap to go to easily pass Manhattan’s Tom Murphy to finish off his memorable double win. Delany’s winning times of 4:03.5 and 1:48.6 made it the fastest 1-day double in history.